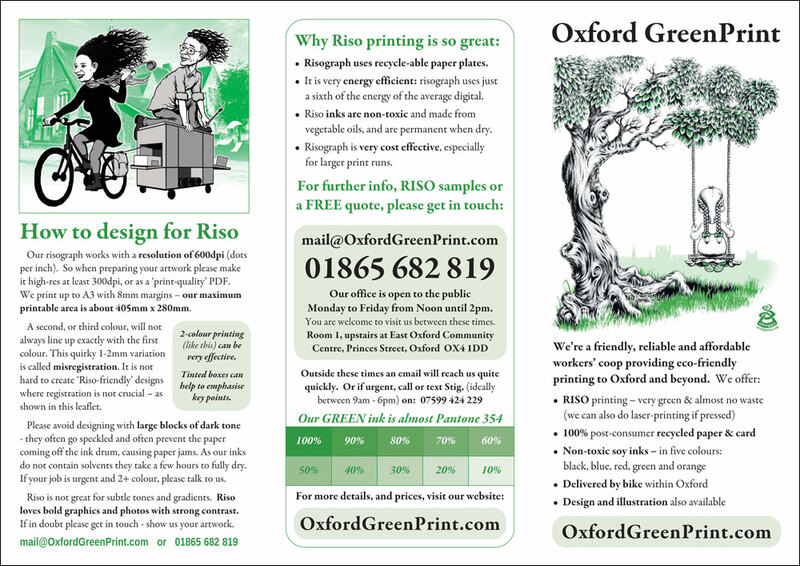 Risograph printing – very green, good value and no waste. Full-colour printing – in certain circumstances. Delivered by bike within Oxford. 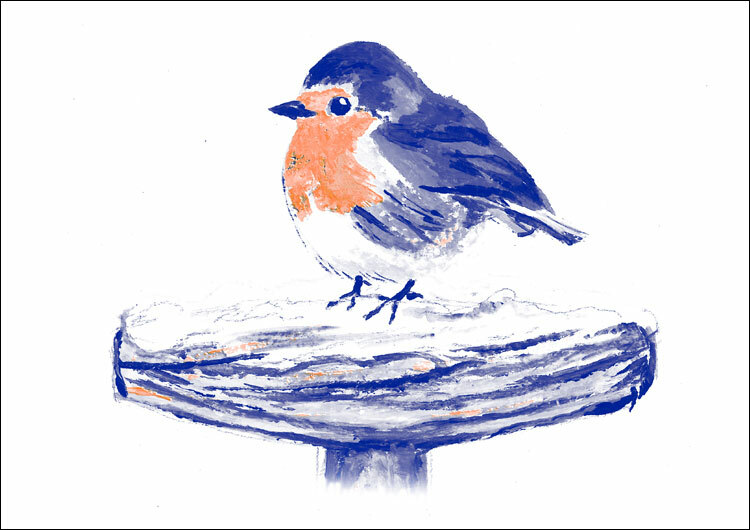 Design & Illustration also available, with discounts for good causes. We do not do photocopying. Please download our introductory leaflet (PDF) to see more about our services, some sample prices, and to learn what Risograph printing can offer. We also offer design, proof-reading, sales of paper and card, comb-binding and lamination. …is our main focus (though we can do some full-colour laser printing). Risograph printing (aka RISO-printing) uses just a sixth of the energy of the average digital printer and generates only recycle-able paper waste. The maximum printable area is 400mm by 280mm. So it’s easiest to simply keep 10mm margins in your designs – what we call “thumb-room”. Large blocks of dark tone will often print slightly speckled. Tones of about 70% are normally quite smooth. Riso is better for bold graphics and images with strong contrast. Any tones of less than about 10% will probably not print – so any photos or designs that have very light subtle tones will look a bit different if printed on the Riso. A key characteristic of Riso-printing is “mis-registration” – a slight difference in the position of one colour relative to another, i.e. with two-colour printing, the exact position of one colour will move slightly (1-2mm) compared to the other colour. It’s unavoidable, but can result in a quirky / rustic design. It’s fairly easy to allow for this, e.g. use the two (or three) colours in ways where they do not need to line up exactly, such as blue text on an orange box. 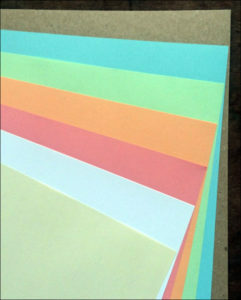 We also have other colour paper (including yellow) in A4 and a range of C6 and small square envelopes. wrapping papers (A3) – see the new page “Festive goodies“. Combined with 100% recycled paper, Riso-printing is very green and cheap. 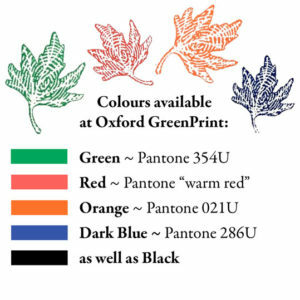 Save money and help the planet by choosing Risograph printing at Oxford GreenPrint. Most of our customers are community groups, campaign groups, NGOs, non-profit social enterprises and local businesses. We like, when able, to support ethical community groups and projects. Therefore all prices are negotiable. We reserve the right to refuse work. 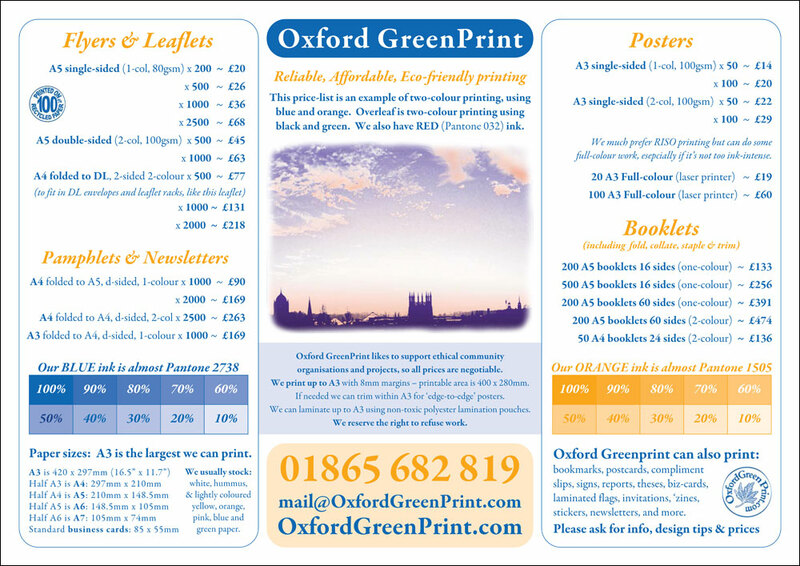 Oxford GreenPrint was set up by three friends who realised there was a need for printing that doesn’t cost the earth. In 2012 we became a Workers Coop to reflect our business ethos.